Getting started with losing weight and trying to eat more healthy in general? Avoid fried food – especially french fries. We all love fried food. You could put breading on a freaking SHOE and deep fry it and it would taste good, I know. “Yes please” would be my first reaction. I want you to like me, but fried food is EXTREMELY unhealthy and fattening – much more so than most people realize. 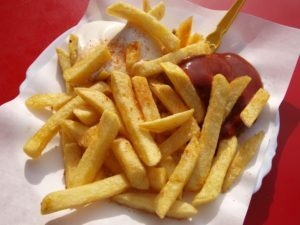 Fried food, especially french fries, give off a chemical (called Acrylamide if you would like to research this further) during the frying process. The longer things are fried the more prevalent this chemical becomes. The trans fats in fried foods are giving us heart disease (the number one killer in most of the world), and they are making us fat. Restaurants often reuse unhealthy oils (hydrogenated oils), changing their composition and cause more oil to be absorbed into the food. These oils are also proven to increase your bad cholesterol and decrease your good cholesterol. These oils are so unhealthy that the US Government started banning them, and the ban will be fully in place by the end of 2018. This may be too little, too late, however, as many of the new oils that are being used or plan to be used may be just as bad. There was a study in Italy where they observed about 4400 middle-aged individuals. A few hundred of them died during the long-term study. Among those that passed away, those that ate fried foods had twice the death rate of those who didn’t. That’s a pretty strong case against deep-fried menu items. It’s also making you blind as you age, according to a USDA study that showed increased macular degeneration among those that eat fried foods. French fries are the number ONE most eaten food by toddlers in the United States! 30% of children in the United States are obese. Europeans are doing much better, but they are catching up, especially in England and Ireland. Germans are doing a bit better and Italians are doing great, for the record. Prego. Many modern dieters are jumping on the low carbohydrates band wagon, but a gram of fatty oil has more than twice the calories than a gram of healthy carbohydrates. If you are getting started with weight loss or trying to be healthier in general. Skip the fried foods on the menu and order something else. Stop eating fast food french fries.